A new country is beginning to form in the chaos and confusion of Yemen’s civil war. A coup in Aden in late January 2018 has hastened the process. The new Yemen has its roots in the period 1990 to 1994, when the Saudi-supported North Yemen and the Cuban/Soviet-supported South were forcibly united. The united Yemen was dominated by a clique surrounding North Yemen president Abdullah Saleh. Although he eventually appointed a southerner – Soviet-trained Maj. Gen. Abdrabbuh Mansur Hadi as his vice president, Saleh ruled the country like a family enterprise. He appointed his son, nephews and other members of his family and tribe to all important positions of the military and the state. All the power, and most of development, were concentrated in Sana’a, and the Saleh clique had the final word in every single state affair. Saleh and his clique tended to disparage the southerners as “Eritreans” and “Indians,” because Aden was predominantly populated by people who came the region as laborers during the British colonial period. Saleh initially cooperated with Salafists and appointed some of them to various positions of secondary importance. Before long, their growing influence became a matter of major concern for him. In the mid-2000s, Saleh provoked a war with a movement of Zaidi youth, which became known as the Houthis. To fight the Houthis, the Yemeni military mostly deployed units affiliated with the Islah Party. For a while, the resulting war worked in Saleh’s favor, especially as both sides suffered extensive losses. When that conflict embroiled Saudi Arabia in 2009, Saleh’s intelligence services several times attempted to have his major competitor, Islah-affiliated Maj. Gen. Ali Mohsen Al Ahmar, assassinated by way of Saudi air strikes. There were deep rifts within the Yemeni military. These became obvious when Saleh was forced to step down in 2011. As the new president, Hadi introduced sweeping reforms of the military and the state, all designed to purge both of Saleh’s clique. His reforms backfired. By 2014, nearly all of the military had mutinied against his rule. Other units, including much of the Yemeni air force, were still commanded by Saleh’s relatives. During the same year, Saudi Arabia declared the Muslim Brotherhood a terrorist organization. Correspondingly, it stopped all support for the power-block centered on the Islah Party. The Houthis seized on the chaos and made an unopposed advance into the Yemeni capital in September 2014. As opportunistic as ever, Saleh quickly sided with the Houthis, forming a coalition that attracted up to 60 percent of the Yemeni military. The rest of the military – and thus the entire country – followed in fashion. Al Ahmar’s units openly sided with the Islah block. Only a few units sided with Hadi, who never enjoyed popular support. At top — an MRAP belonging to the Emirati-supported Security Belt Forces advancing against Hadi loyalists in Aden. 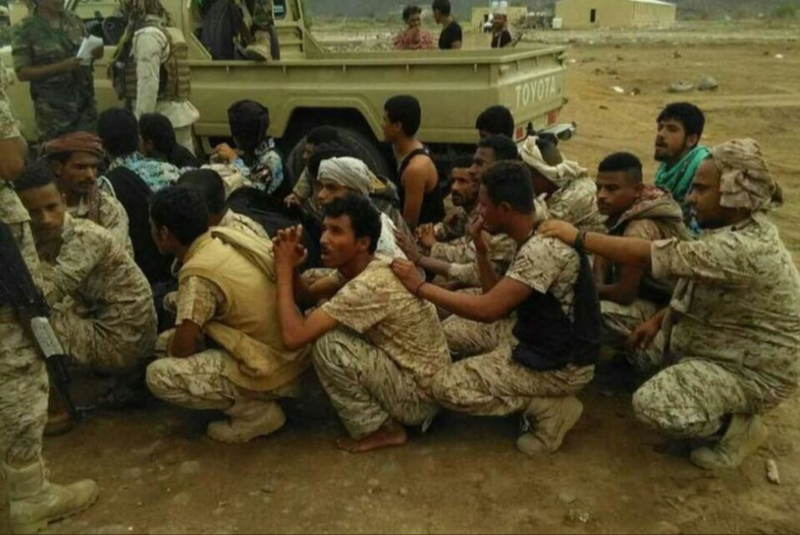 Above — captured soldiers from Hadi’s Presidential Guard in Aden. Photos via A. M.
Furthermore, when the Houthi-Saleh coalition launched its advance into southern Yemen in March 2015, many local military units sided with various local alliances, all dominated by South Yemen separatists. This was the situation at the time Saudi Arabia created an alliance of Arab states and launched its military intervention in Yemen. The Saudi-led operation proved highly successful. Following three months of intensive air strikes, Saudi, Emirati and allied forces landed in Aden and then steam-rolled Houthi forces toward the north. By September 2015, they had recovered all of former South Yemen and much of central Yemen on behalf of Hadi’s government. However, the forces deployed by the Saudi-led coalition numbered no more than 40,000 … and faced up to 200,000 combatants from the Houthi-Saleh coalition. There was no Yemeni police and no military to secure the areas behind the advancing forces of he Saudi coalition. This resulted in a situation where diverse groups – including Al Qaeda on the Arabian Peninsular and southern separatists brought sizeable parts of southern Yemen under their control. Obviously, this was in nobody’s interest. Correspondingly, the Saudi-led alliance was forced to stop its advance and begin work creating a new Yemeni state. Ever since, Saudi and Emirati politics in Yemen have gotten in each other’s way. Realizing that Hadi still enjoyed no political support, the Saudis reversed their decision on the Muslim Brotherhood. Indeed, Al Ahmar was appointed the minister of defense in Hadi’s government, thus nominally putting all Islah-affiliated military units and tribes on the side of the presidency. On the contrary, the Emiratis intensified their cooperation with the southerners, foremost the separatists and the Hadramawt Confederation. Emirati and allied forces spent most of 2016 and 2017 fighting AQAP in southern Yemen and strengthening their grip over this part of the country through the creation of the Southern Transitional Council – a de-facto new government of southern Yemen. Unsurprisingly considering their different aims, the two emerging power blocks were at odds before long. Their mutual differences were what led to the latest coup against Hadi’s government in Aden in late January 2018. Because of their persistent insistence on Hadi as the legitimate president of Yemen, neither the Saudis nor the Emiratis are in a position to drop the official government. Therefore, and despite the success of the Emirati-supported forces, we can expect the situation to soon return to what it was before the coup. The only difference will be that Hadi loyalists will have no effective power in Aden any longer. The net result could be the creation of a statelet comparable to Somaliland — an independent, Emirati-supported South Yemen, indirectly allied with the United States, but not recognized by any outside powers.